For environmentally conscious businesses we are excited to offer you the opportunity to partner with The Noble Bee, in making a positive contribution towards helping bees, by sponsoring your very own beehives. If you have the space, for example on top of a city office building, a hotel, a theatre, the gardens of a stately home or any suitable outside area, you might want to consider keeping some of your own beehives. It’s important that businesses contribute towards helping the plight of bees and the more people that get involved the better. If you do not have the appropriate space, then we can also keep your bees at one of our apiaries in The New Forest. Getting behind the bees for business project, not only helps the bees but can have brilliant benefits for your business, offering the opportunity for some fantastically unique and engaging PR opportunities. You will receive the honey that your bees produce, which can be given to staff, or clients, or you can do with it as you wish. We will send out quarterly newsletters on the progress of your bees and we can also engage your associates with the whole process. We can also assist in helping you to garner the positive publicity you deserve, to help spread the word. We will provide all the care that your bees require and look after the bees for you, making sure they maintain excellent health. During the height of the beekeeping season from May to August we will pay weekly visits to the bees, and during the winter months when the bees go dormant, we will pop in once a month just to check up on the bees. If you decide to sponsor a beehive, We can also offer fun team building days, where your staff can learn all about bees, taste different honeys from around the world and even spin out and jar the honey from your hives. We also offer Beekeeping experience days from our base at Furzedown Farm Conservation area. Click here to find out more. If you are interested in the bees for business project, please get in touch. We would be delighted to come to your business and have a good chat about the possibilities. Or if in the mean time you’d like more information, please drop us an email and we can forward you our full information pack. 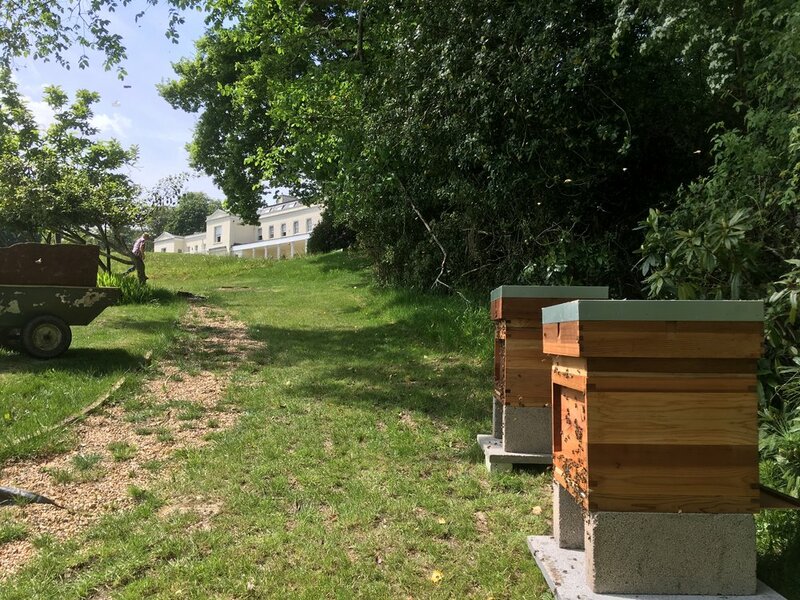 We look after beehives for residents at Northerwood House in The New Forest.